Baby massage is a longstanding tradition in many cultures, including Chinese, Indian, African and Swiss. Baby Spa combines techniques from Western and Chinese massage techniques to give your baby a tailored massage experience. Baby Spa strongly encourages parents to learn how to massage their own babies so this can be done daily at home. Please see benefits of baby massage below. Baby swimming or hydrotherapy from birth is fantastic for your baby's health & development, and could spark a lifetime’s interest in the sport. Each swim provides a complete physical work-out, strengthening your baby's heart and lungs and in turn aiding development of the brain — including stimulating all 5 senses (taste, smell, touch, sight and sound). And with each lesson burning up to 300 calories, you’ll get a work-out playing with your baby too! Introducing children to water at a very young age helps prevent a fear of water developing later. 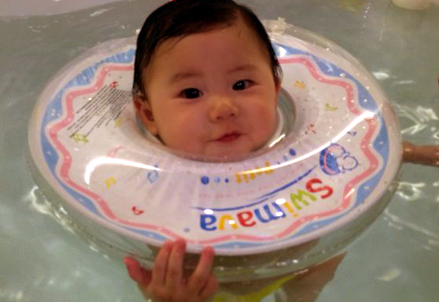 Exercises that involve moving independently in water and holding on to the side are wonderful for your baby’s confidence. You’ll be so proud of what your baby can do. * Benefits quoted from WaterBabies.